The Mid-Atlantic Great Dane Rescue League is a DC-based volunteer group that is dedicated to providing the rescue and care of Great Danes that have been abandoned, neglected, or abused. They work tirelessly to supply medical treatment and training with the ultimate goal of placing the rescues in a permanent, loving home. Regina Hill is a foster mom for the Mid-Atlantic Great Dane Rescue League who brought in a foster pup named Zane. Zane is a beautiful Great Dane with a severe allergy to anything with feathers. That means no chicken, duck, turkey or eggs. Regina was beginning to find it difficult to find high-quality food without any fowl ingredients. His allergy became so severe that he needed to take 8 Benadryl daily to prevent any allergic reactions. Regina was beginning to find it difficult to find high-quality food without any feather-free ingredients. She wrote to us telling us about Zane and his particular dietary needs. We sent over a few cases of our Freshpet Vital Grain-Free Beef & Bison recipe, which Zane immediately ate in earnest. A few weeks later we got this wonderful note from Regina. 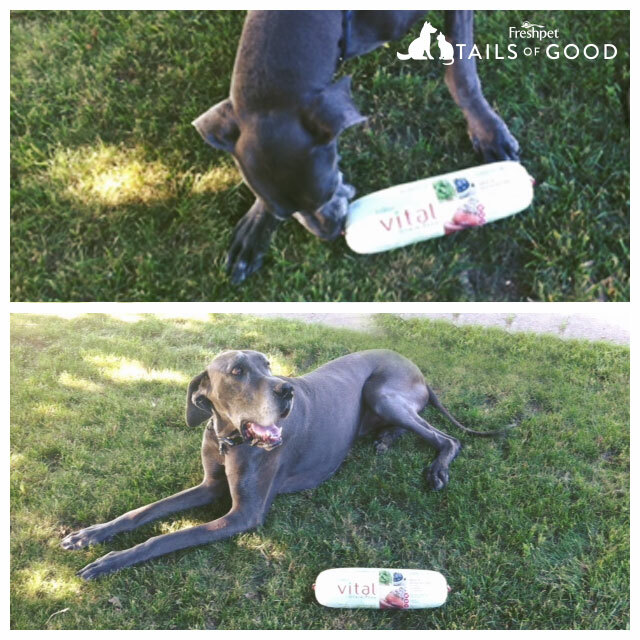 “I started to incorporate Freshpet Vital to his diet a month ago and I have to admit I am tickled pink with the results. Zane dives into his food. Most importantly he is only taking half the Benadryl he used to. What more can a mother of a four legged child ask for? Being on a tight budget and having five Great Danes, your donation has significantly helped my family. Great Danes require high quality food and when I foster many of the Danes come in malnourished or worse. Your donation has helped several Danes get healthy and move on to their forever homes.” We could not have been happier to hear that Zane was feeling better and eating well. As the pictures show, he is one handsome and healthy pup! If you know of a pet or family member who deserves a Tail of Good, we want to hear from you! Email us at [email protected], or send us a message on Facebook or Twitter.